Meet in the front of the west side of the historic Pima County Courthouse building next to El Presidio Park. Field Trip Leader: Alex Schauss, a member of the UA Gem and Mineral Museum Advisory Board, and Research Associate in the Department of Geosciences, will lead the tour. Location - 115 North Church Avenue, Tucson, AZ 85701. Bounced by Wes Alameda Street, West Pennington Street, and North Church Avenue. 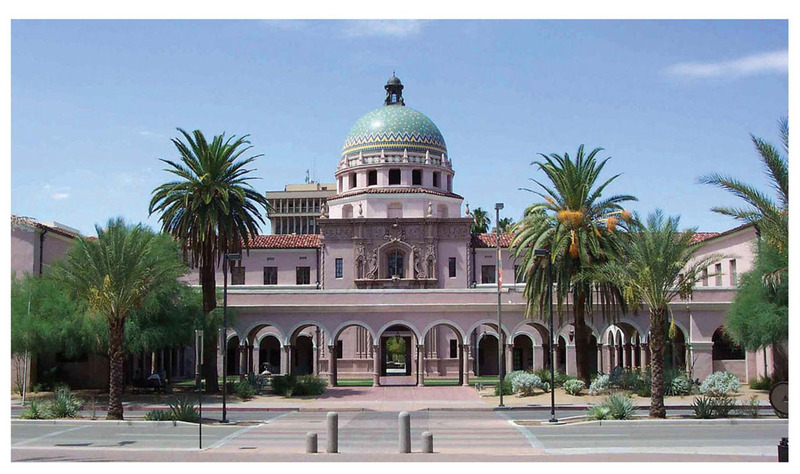 Logistics - Meet in the front of the west side of the historic Pima County Courthouse building next to El Presidio Park. Parking - Parking is available at any available street meter, or underground under the El Presidio Park. Entrance is at West Alameda Street, just west of the intersection of North Court Avenue and West Alameda Street. RSVP is required by Noon, Thursday, March 28th. Specify name, guest spouse, and provide an email. Personal Protective Equipment - Hard hats will be provided by the County. No open toe shoes allowed (it is an active construction site). Tour Description -Exclusive tour for Arizona Geological Society members and their spouses of the future home of the University of Arizona Gem and Mineral Museum at the Iconic and Historic Pima County Courthouse. The tour will take the group through the entire building whose interior has been gutted to prepare construction for future leasehold tenants. This includes several levels of the building that will house the new UA museum, new laboratory, auditorium, storage facilities, meeting facilities and exhibit areas. This may possibly be the last tour offered large groups until the museum opens in early 2020.